In 2009, Rep. Joe Wilson (R-SC) apologized profusely to the White House for shouting, “You lie!” as President Barack Obama told Congress that Obamacare would not cover illegal immigrants. Now it would appear that the White House owes Wilson an apology, as Covered California–the flagship of state Obamacare exchanges–is recruiting illegal (“undocumented”) immigrants to sign up for the program, regardless of their eligibility. 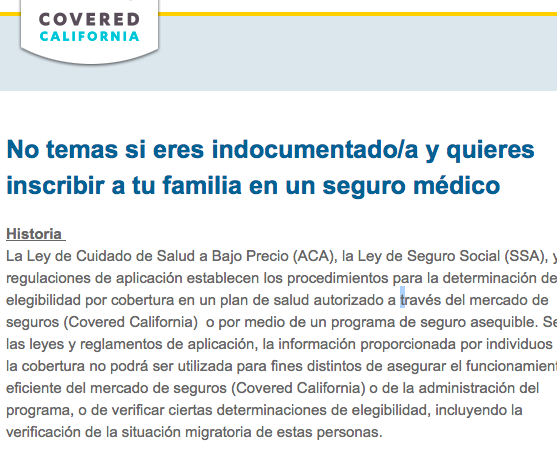 The Covered California website includes a special page entitled: “No temas si eres indocumentado/a y quieres inscribir a tu familia en un seguro médico” (“Fear not if you are undocumented and want to enroll your family in health insurance”). The website goes on to explain that information shared with Obamacare cannot be shared with Immigration and Customs Enforcement (ICE). It does not explicitly warn that illegal aliens are ineligible. As Bloomberg News notes, Latinos have been slow to sign up for Obamacare, partly because of problems with the Spanish-language version of the Obamacare website, and partly because some immigrant families are afraid of providing information to the government or using public assistance, among other factors. Covered California is devoting additional resources to recruiting more Latino enrollees before the deadline at the end of March. Obamacare has been under greater pressure to produce impressive enrollment numbers as the program comes under more intense scrutiny from politicians and the public, providing a possible motive for recruiting illegal aliens to enroll. Earlier this week, the federal government announced that 3.3 million people had signed up nationwide, but that included people who had not yet paid, and actually represented a slowing rate of enrollment, with too few young people joining the program.